The Joovy Scooter is different than the competition in many ways and you'll notice it the instant you grab the super comfortable [ergonomic] push handle. Don’t be fooled by the plastic grips, they have steel inside and are extremely strong. The stroller has a unique look and all the right features. The Scooter has world class looks, great functionality, and high quality components, making it the best value available in single strollers today. Huge Joovy Canopy: The Scooter includes Joovy's signature oversized canopy with a retractable sun visor - for maximum protection from the elements. Super Durable 600D Fabric: The seat and canopy are super durable 600 D fabric with an adjustable and light reflective 5 point harness. Deep Recline with Unlimited Positions:The one hand recline system locks in infinite positions all the way down to 149° for a near flat napping position. Compatible with Graco Carseats: The bumper bar can be used as a car seat adapter for all Graco infant car seats. Cup Holder: The Scooter has cup holder and zippered pocket for parents. Linked Brakes: The Scooter has linked rear brakes adding extra security when the stroller is parked. Large Basket: The large basket is absolutely giant compared to other strollers in this price range with incredibly easy access. If your a long time reader, than you are already aware of my affinity for Joovy Family Gear. Every encounter I have had with their products leaves me in awe! They think of everything you would want in family products....and so much MORE! When we had our first child, I used to think to myself with most of the baby gear that we had.....it could be better this way..or why didn't they include that?! If there was a missing feature, you either had to simply work around it, buy an additional accessory to improve the product.......or scrap it and buy a whole new product in some cases (who really has the budget to do that? we certainly didn't). With Joovy Family Gear, that never has to be a concern, they know exactly what parents want & need in family gear, and include everything in their great products that are built to last (really these products are built well to withstand use by more than one child). I knew that I could expect the same greatness from past experiences with their products with the new Joovy Scooter, and I was right. With an extremely affordable price point, the Scooter easily is the best of stroller's in this price range. The curved handles make maneuvering this stroller super simple even when steering with one hand ( if your holding another child's hand / cell phone / bags as I often am ;). The over sized basket is also another feature that you will not likely find in such an affordable stroller (very appreciated by this mom; who wants to juggle bags while pushing a stroller? !....we're parents not pack mules right?!). As with the other Joovy stroller's, the Scooter is equipped with a five point harness (not all strollers have this, though in my opinion...they should!) that keeps little one's safe while in movement. I also want to draw attention to the linked brakes for added safety (I know that on more than one occasion I only braked one side of the stroller by accident, which can be dangerous with a toddler in the stroller). With it's sleek design and array of features, Joovy has done it again! They've created the perfect stroller at an amazing price point! What more could a gal ask for?! Experience the greatness of Joovy Family Gear! One lucky reader will receive a Joovy Scooter! 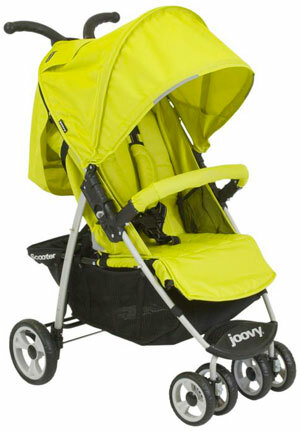 Leave a comment~ Visit http://www.joovy.com/ and let me know another product that you'd love to have for your little one. The comment is considered your entry. 2) Tweet ~Joovy Family Gear! Only the BEST for your FAMILY! 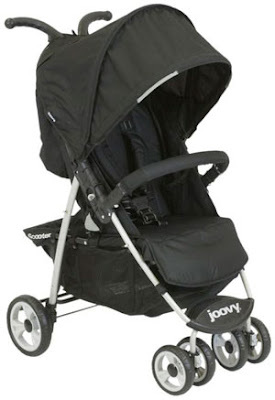 #WIN a Joovy Scooter Stroller (RV$149.99! )@savvycouponmom http://bit.ly/fih8Q4 #Giveaway (can be repeated twice daily for additional entries~ copy paste please~cut and paste- the bit link must be posted in the tweet - I will check) (Additional 5 Entries - 5 Comments). I love the BIG CABOOSE! We're expecting #3 and will have 3 under 3 (no twins). This looks like just what I need! I'd LOVE love LOVE to have the Caboose! GFC follower I like the Nook Highchair too! I'd like Cocoon for stroller class!